WEBCAST: Water Well Rehabilitation– Video Logging Techniques for Planning and Process Assessment from 12-1:30pm. Click here to register. WEBINAR: Draft SGMA Basin Prioritization from 12-2pm. Click here to register. Feds push to raise Shasta Dam, but would it ease California water woes? “Officials with the federal government seem determined to realize a controversial proposal to raise Shasta Dam and increase the storage capacity of the reservoir behind it – despite objections from fish and wildlife agencies and California law that technically forbids such a project. 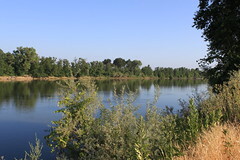 In January, the United States Bureau of Reclamation, which manages the dam, received a $20 million appropriation from Congress to begin design and preconstruction work – and, with the support of water agencies in the San Joaquin Valley, the bureau has announced plans to begin construction as early as the end of 2019. … ” Read more from Water Deeply here: Feds push to raise Shasta Dam, but would it ease California water woes?